The Three Rivers Arts Festival opened yesterday. Lots of people are planning on coming down to see the art, but come between 11am and 2pm from today through June 14th and you can help create it. Muralist Kim Beck has begun stenciling an 850-foot mural underneath the Fort Duquesne Bridge and is ready for volunteers to help fill in the “paint by number” with black, white and gray paint. Looking at her Tumblr, you can see that Kim Beck (previously featured on I Heart PGH) has a fascination with the mundane and ephemeral aspects of the urban landscape, like billboards, sky writing and plastic security fencing. She carries that idea forward here with the mural that depicts common, hardy, native plants. In other words, weeds. I like the project because it works at different scales; up close I think it will read as almost abstract because of how large the plants will be, and from the other side of the river it will be cool to see weeds sprouting at the foot of the city. If you miss the window to help with the mural, you should still stop by and see some of the items on display. 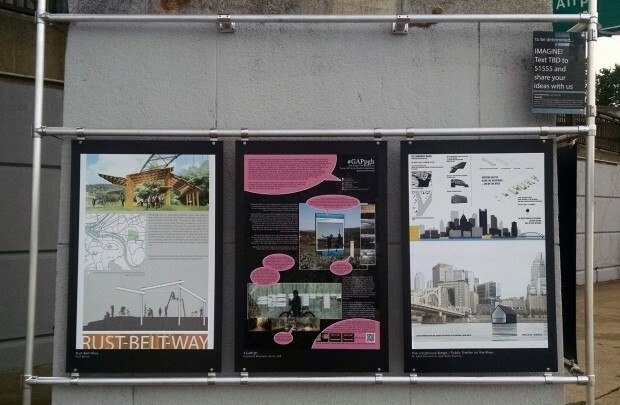 Riverlife has partnered with the Pittsburgh chapter of the American Institute of Architects to showcase past proposals by young architects on how to better utilize “urban voids”. The proposals were submissions to the Young Architects Studio Competition over the last few years, which was created as a way for young architects to express themselves and be involved in Design Pittsburgh, an annual event held by the AIA to celebrate architecture and give awards for design. The exhibit will last all summer, and Riverlife is planning events in the outdoor exhibit for every Wednesday through the end of August. Stay tuned for more details on those events as they become available. The mural and gallery are collectively known as #tbd, so follow Riverlife on Twitter, search that hashtag or just keep reading I Heart PGH. So come down and create some art of your own, this weekend or any day until the Arts Festival closes on June 14th. 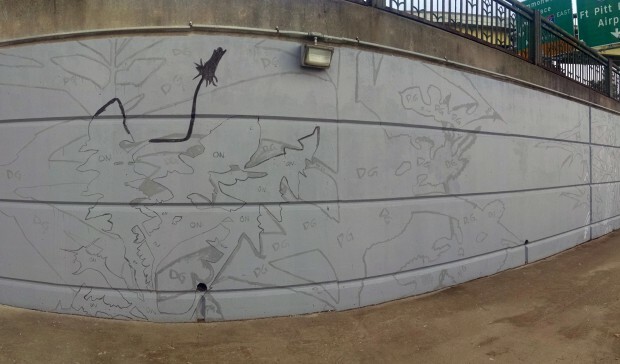 Between 11am and 2pm you can help paint a mural under the Fort Duquesne Bridge. If you’re walking, it’s most easily accessed by walking towards the Point fountain and turning right after walking under the bridge. When you hit the Allegheny River, walk upstream until you see people with brushes and rollers. See you there.